volunteers, so some of the donated funds go to support our efforts to get more dollar donations. Giving a donation is as as easy as a few mouse clicks. If you would like to donate through a safe oline process, please click on the PayPal Donate button on the left. To learn more about PayPal, visit www.PayPal.com. What if American Maltese Association Rescue earned a penny every time you searched the Internet? Well, now we can! Good Search.com is a new search engine that donates ad revenue, about a penny per search, to the charity of choice designated by the user. Use it just like any search engine as it is powered by Yahoo, so you get the same great results. To make an online purchase go to Good Search, click on the GoodShop icon, a list of participating stores will drop down. Select the store you desire to make a purchase, and a percentage of your purchase is made to American Maltese Association Rescue. Just click on the Good Search icon to the right and start searching or the GoodShop icon to make a purchase! “Do you walk, run, or bicycle? You can donate to help Maltese rescue dogs without any money out of your pocket. Your exercise miles can translate to funds for AMAR. There is an application for smart phones that helps you keep track of the miles you’ve exercised, and donate funds to save rescue Maltese at the same time. It is called WoofTrax, and is available in most smart phone app stores. Sign-up with WoofTrax , and in the set-up tell the app the donations go to American Maltese Association Rescue. This app provides you with helpful statistics about your exercise, like how far you traveled, time spent exercising, and your average speed. It even gives you a map showing where you exercised. AMA Rescue cannot survive without the help from our wonderful donors. For those that want to make a difference for a Maltese in need, but who cannot foster or adopt, here are several vital ways you can help. There are plenty of Maltese that need rescuing, and there are plenty of Adoptive homes just waiting for the right Maltese. The big gaps in saving Maltese are twofold. 1. We need Foster Homes, to serve as the interim home while the rescue dog receives medical care. 2. We need the funds to pay for the medical care. 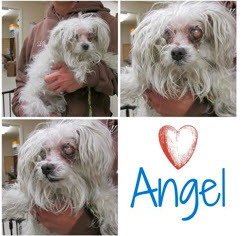 Special Angels - Please visit our Special Angel page where you can read the stories of the Forever Fosters who will be with AMAR for the remainder of their lives. There is a Donate button under each story if you can help with the continuing medical costs for one, or more, of those unadoptable dogs. Monthly Donations - To make it easier on you, we have a monthly donation program where you can choose a monthly amount and set-up regular payments to AMAR. You can do this with PayPal or by sending checks to the mailing address above. We will be happy to send you preaddressed envelopes if you’d like. Just let us know.